Together with Lincoln Financial Foundation, the Ruth Sokolof Theater is showing their “Forever Young Family & Children’s Series Spring 2016” series. I’m pretty sure you don’t actually have to have a family or children to go, which is good, because I don’t have the latter and deny having the former! But I still want to see the lineup, which includes Only Yesterday, April and the Extraordinary World, Moon Man, Muppet Treasure Island, (non-Muppet) Treasure Island and Wolf Children. Remember: kids under 12 get into the movies for just $2.50, and adults get to experience a brief respite from handling kids under 12. Starting April 15, Film Streams’ “Great Directors” series focuses on Chantal Akerman. Sponsored by Omaha Steaks and Sam Walker, this installment focuses on a woman whose work blended various filmmaking forms before she apparently took her own life last fall. The series includes Je Tu Il Elle, No Home Movie, Jean Dielman News from Home and a documentary about her work, I Don’t Belong Anywhere: The Films of Chantal Akerman. Even if you don’t have an innate love for French cinema, you probably love French toast and French fries. So trust that the French make yummy things and go see Akerman’s work! 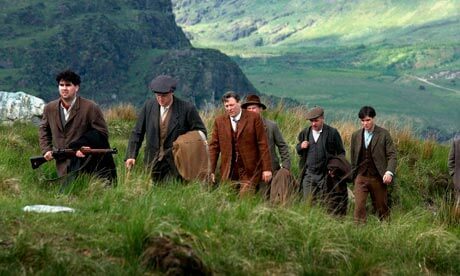 On Tuesday, April 26 at 6:30 pm, Film Streams and the Omaha Irish Cultural Center will hold a special screening of The Wind That Shakes the Barley, followed by a panel discussion. Even cooler: at 6 pm, Jill Anderson will be performing some pre-show Irish ballads! This is in observation of the 100th anniversary of the Easter Rising, which was the birth of the Irish independence movement and not a celebration of the one time you woke up early to find Easter eggs before your sister.